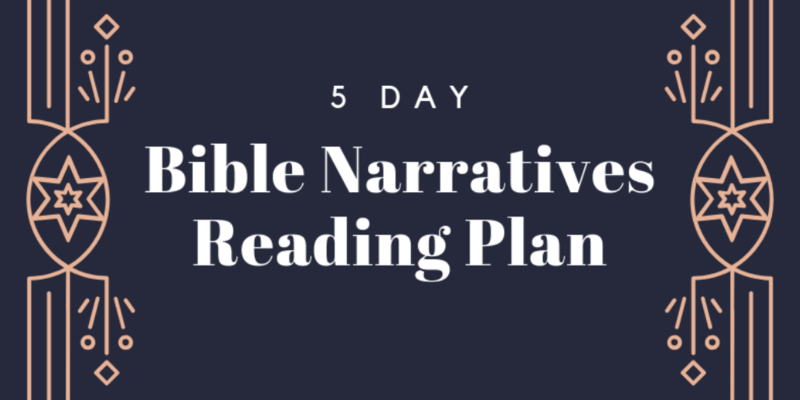 Download a free 5 day Bible Narratives Reading Plan for 2018 here. This week our family is finishing successfully reading through the whole Bible. Each of us has independently read through the Bible using the same Bible reading plan. We used this 5 day chronological reading plan. We liked it because it was only five days per week, which allowed us to catch up on the weekends if we got behind. We also like that it was chronological, bringing appropriate Psalms in when they fit the narrative. We made it; yes, even a 6-7 year old can read through the Bible in a year! But it was tough (especially for Kate) to read such long passages each day. Some passages were also a bit awkward for a 7 and 9 year old to read (“Mommy, what’s….?). Read through all of the major narratives of Scripture in a year. Even though Scripture treats objectionable narratives tastefully, there are still a few passages I’d like to skip for our young children. I did find, however, this nice web site that focuses on summarizing the major Bible narratives, and it just happens to have 270 narratives, which is exactly the number we need for reading 5 days per week for a whole year. So I dug through the site and collected the passages they used. I used that as a starting point, but then I considerably adjusted the list to form my own 5 day Bible Narrative Reading Plan. I also added Psalms and Proverbs throughout the year and skipped a few of the more colorful stories. The daily readings are a bit more manageable for young children to read in one sitting, averaging about 2 chapters (roughly 50 verses) per day. Links no longer valid. Download the 2018 reading plan here. So we will use this plan for our individual Bible reading each day. For family worship, I plan to review and discuss what we each read that morning. I’m also planning on using The Bible Story Handbook on occasion as well. The narratives don’t line up perfectly, but I’ll use it when applicable to guide our discussion as a family. We may also use some of the resources (summaries, videos, etc.) on the BTStories site. We’re really looking forward to reading through the Bible’s narratives this year! Please let me know in the comments if you plan to use this as well, and please send me any tweak suggestions you have as you read through the plan. Thank you for sharing this!!! We were just talking about getting our family to reading more this year!